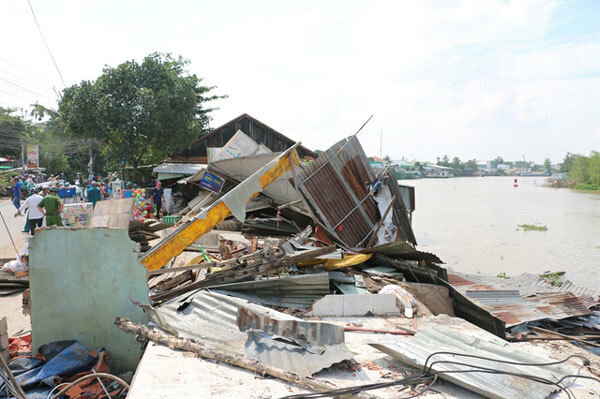 The Mekong Delta needs sustainable measures and sufficient financial resources to mitigate serious erosion along rivers and coastal areas, Deputy Minister of Agriculture and Rural Development Ha Cong Tuan, has said. Speaking at a seminar held in Ca Mau Province on Tuesday (April 9), Tuan said that erosion in the delta had worsened in recent years because of climate change and human activities. Do Duc Dung, head of the Institute of Water Resources Planning, said that construction measures and replanting of forests along coastal areas should be done to protect sea dykes. However, erosion has increased rapidly in recent years. Ca Mau and Tien Giang provinces have large eroded areas in the delta, he said. Ca Mau has a 250km coastline and more than 10,000km of rivers and canals. Nguyen Long Hoai, head of Ca Mau Province’s Irrigation Sub-department, said erosion has occurred at 105km along coastal areas in the province since 2007. On behalf of Ca Mau, Hoai asked the ministry and the Government to continue to grant money and seek private investors to build embankments in the province. Vo Thanh Ngoan, deputy director of Dong Thap Province’s Department of Agriculture and Rural Development, said besides natural causes, illegal sand mining and construction project along rivers are major causes of erosion in the province. Dong Thap lost 322ha of land from erosion from 2005 to 2018. During the period, the province relocated more than 8,000 households in eroded areas to safe areas. It still needs to relocate an additional 6,000 households in erosion-prone areas, Ngoan said. Seminar participants asked the Government to allocate more money for delta provinces and Can Tho City to develop erosion-prevention projects. Last year, besides an annual budget for erosion-prevention projects in the delta, the central Government allocated an additional VND1.5 trillion (US$64.6 million) to the delta to build 29 urgently-needed erosion-prevention projects.